This is a bit of a leisurely post. After attending Maker Fair 2016 my son wanted to build a racing quad-copter. He did not want to buy a Ready To Fly (RTF) copter but rather a kit based on some recommendations from a pilot of the said show. Anyway, eventually we settled on the BeeRotor Victory210 from RCTimer. 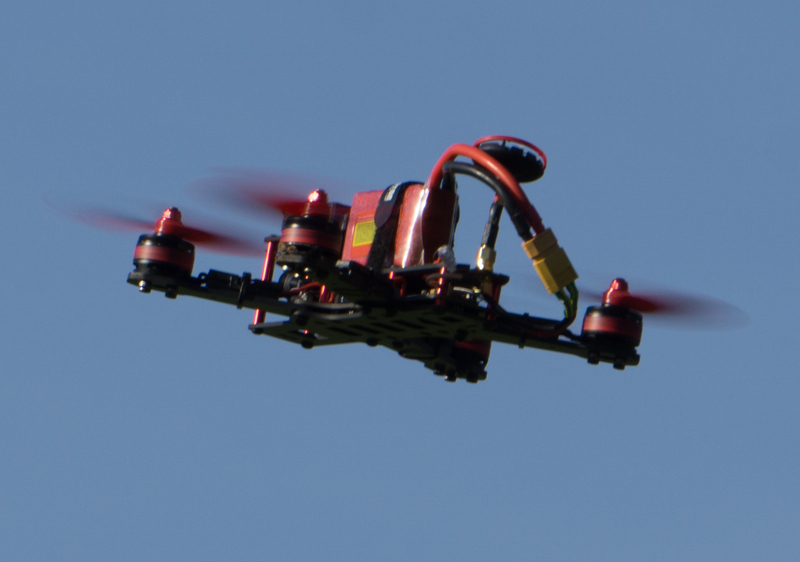 There are a few guides that show step-by-step how to assemble the copter. The most helpful is certainly the one from the Blog of Nathan Vertile. However as a total newbie to the field of quad-copters and RC models We went through a bit of troubles to get everything working. So here are some notes that eventually got us to a flying model. Note, that I will not cover the assembly of the copter in details as we did not have much trouble to follow the guides available on-line. I will mostly focus on the software and configuration part. 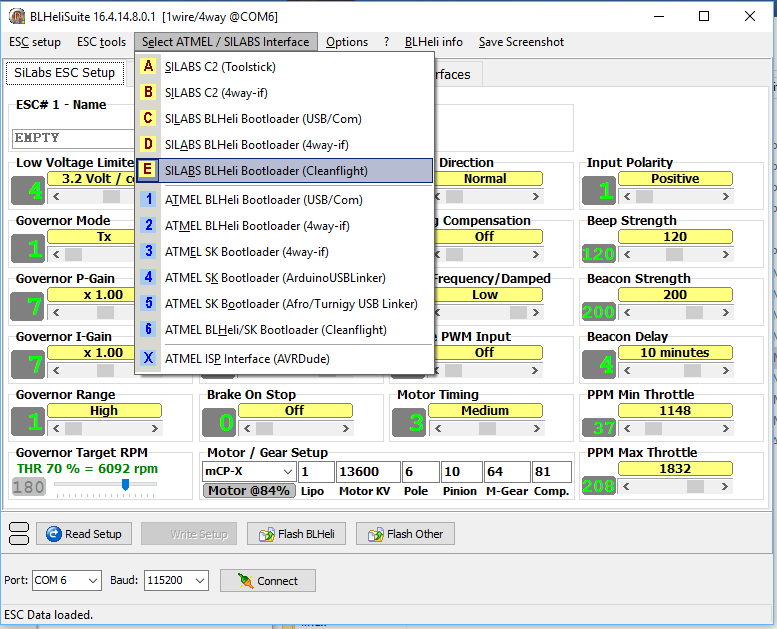 The only thing note worthy is that the four motor controllers (ESCs) are not all connected the same. Pay attention to the direction the motors turn. Connect the Receiver: Once the kit is assembled the receiver needs to be connected to the BRF3 flight controller. We use FlySky IBUS port of the iA6B receiver and connect it to UART3 pin 1-3 (S.BUS) of the connector SB on the BRF3 board. IBUS is a FlySky proprietary interface using a UART channel to forward the control to the flight controller. It replaces the traditional PWM ports. 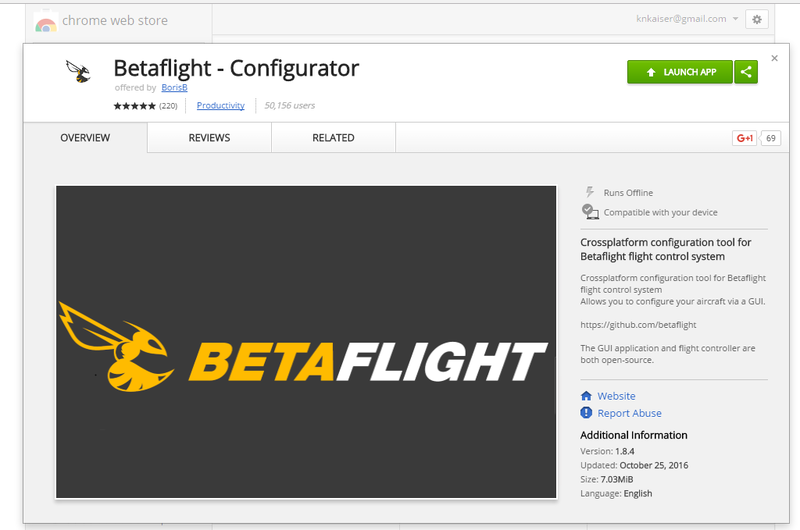 In your Chrome browser click this link: Google Chrome App Store and click the green “LAUNCH APP” button. 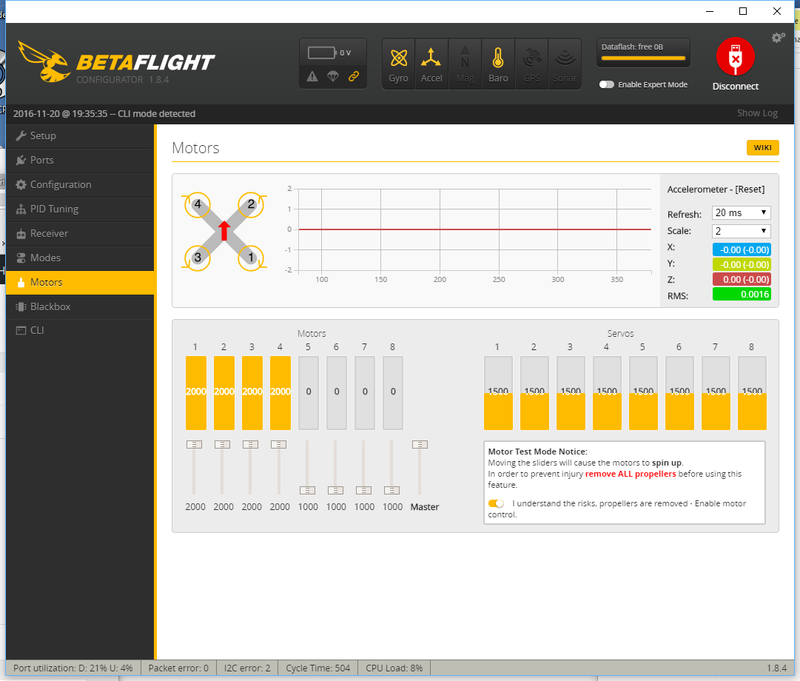 Download the BetaFlight Firmware from here https://github.com/betaflight/betaflight/releases look out for the file: betaflight_x.x.x_SPRACINGF3.hex . I used Firmware Version 3.0.1. 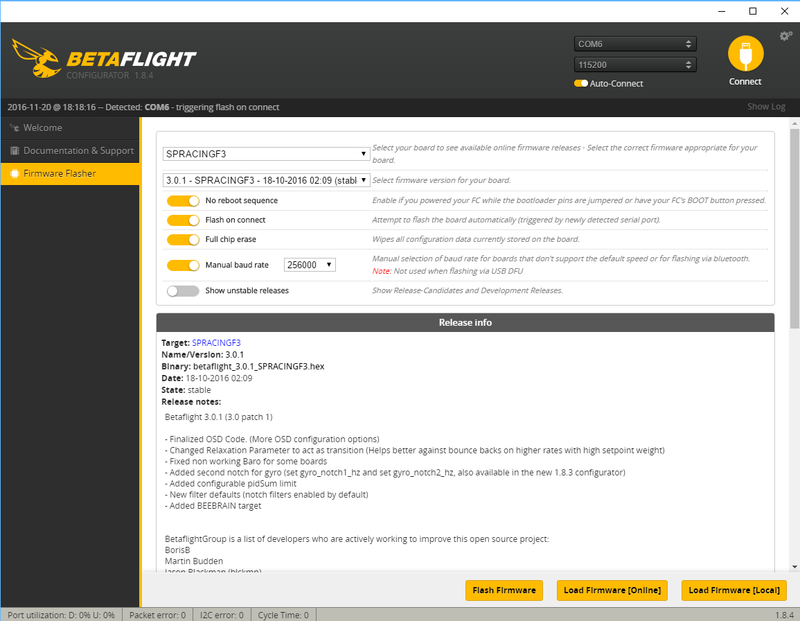 Click the “Load Firmware [Local]” button and load the betaflight_x.x.x_SPRACINGF3.hex file. Connect your computer to the micro USB port of the BRF3 while holding the boot button next to the micro USB connector down. Do not connect the battery to the Victory230 the controller will get powered over the USB cable.. The flash process should now start. Wait until completed successfully. Note 1: you can also simply select “SPRACINGF3” in the firmware pull-down menu and click the “Load Firmware [Online]” button. 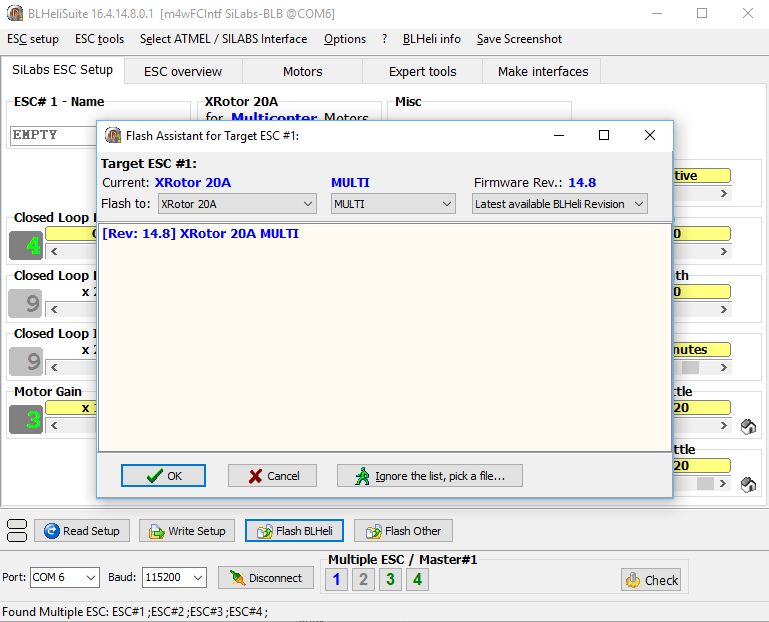 So now that we have flashed the correct firmware we do the same thing for the motor controllers (ESCs). The nice thing is we can use the BRF3 in pass-through to program the ESCs. Update ESC Firmware: this is an optional step and I believe not really required. However because I did it I list the steps to perform it. Unzip it and open the program. Make sure the propellers are off and then click “Connect” button and then the “Check” button. 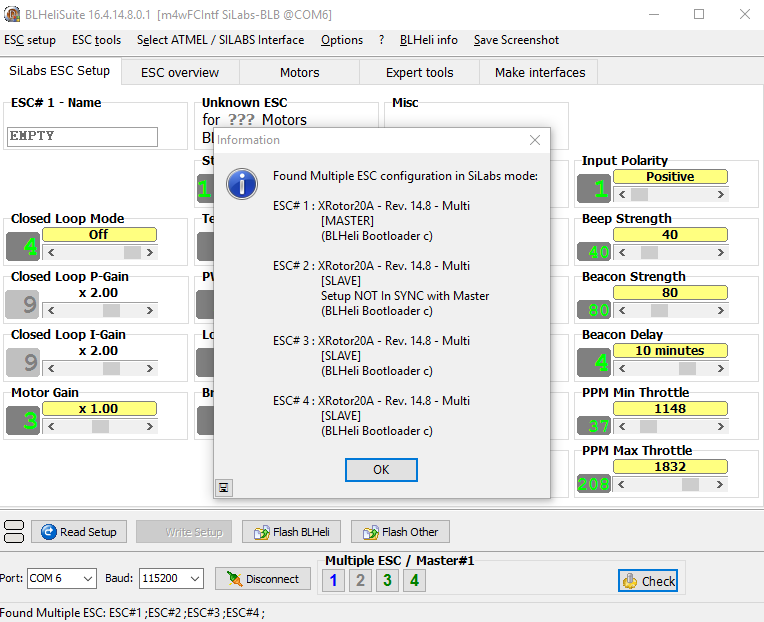 Now you can check the setup of all four ESCs under the “ESC Overview” tab. Note the bold values are the only non-default settings. Put the Victory210 on a leveled surface and under the “Setup” tab click the “Calibrate Accelerometer” button. Then rotate it along all three axis at least 360 degrees within 30 seconds. Now the accelerometer should be properly calibrated. Move to the “Ports” tab and select the “RX” of “UART3” to enable the connection between the BRF3 to the RC receiver. 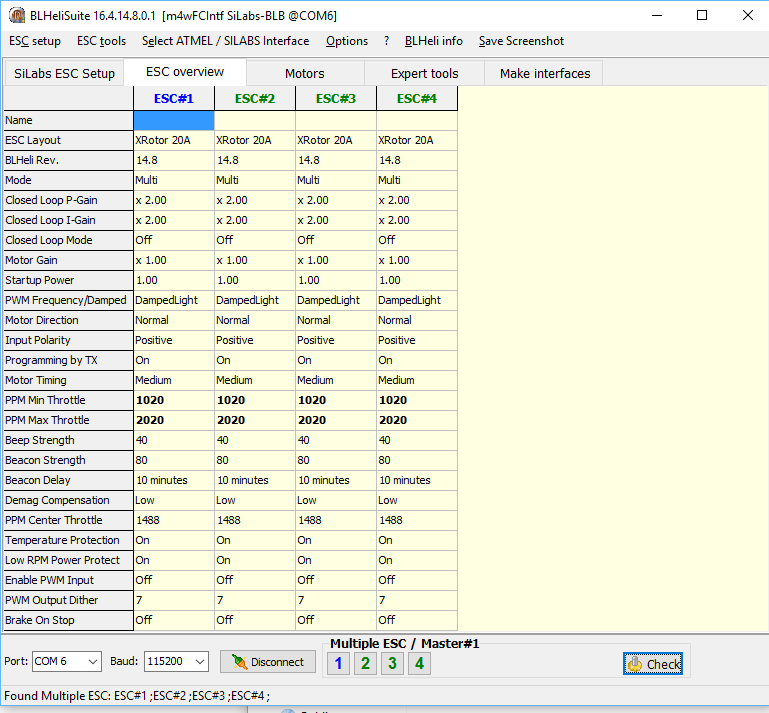 Move to the “Configuration” tab and scroll down to “Battery Voltage” and set “Voltage Scale” to 210. Next turn under the “Current Sensor” the “CURRENT_METER” on. Set the “Scale the output voltage….” to 380. Now the under voltage and over current protection will go off at the right levels. 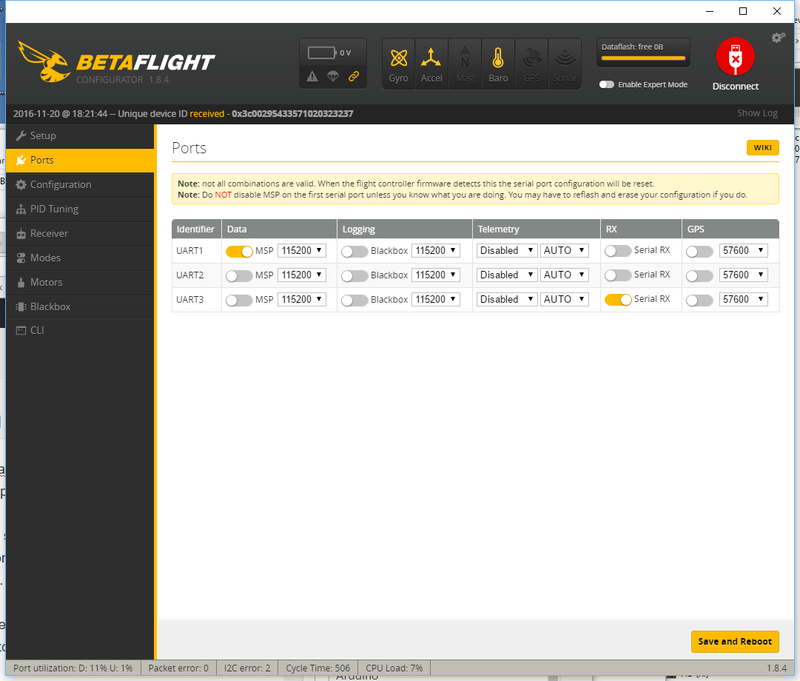 Under “Serial Receiver Provider” select IBUS to the correct protocol for the FlySky receiver. There is not too much to configure. The transmitter should work out of the box and shipped already paired with the receiver. Click on the “Motors” tab. Select the display output and cut and paste to a text editor and save the file. Note: once you have turned the “Expert Mode” on you can also save and restore configurations under the “Setup” tab. Check that when you move the sticks only the related chnannels are chaning. If that is not the case your Radio Controller may do some mixing so you want to check this. Check the Motor control. The motors are secured until you push the throttle stick (in a normal setup the left stick on your RC) to the lower right corner. Once you do this a Beep will signal that the copter is armed and you should see all four motor bars to jump to 1070. 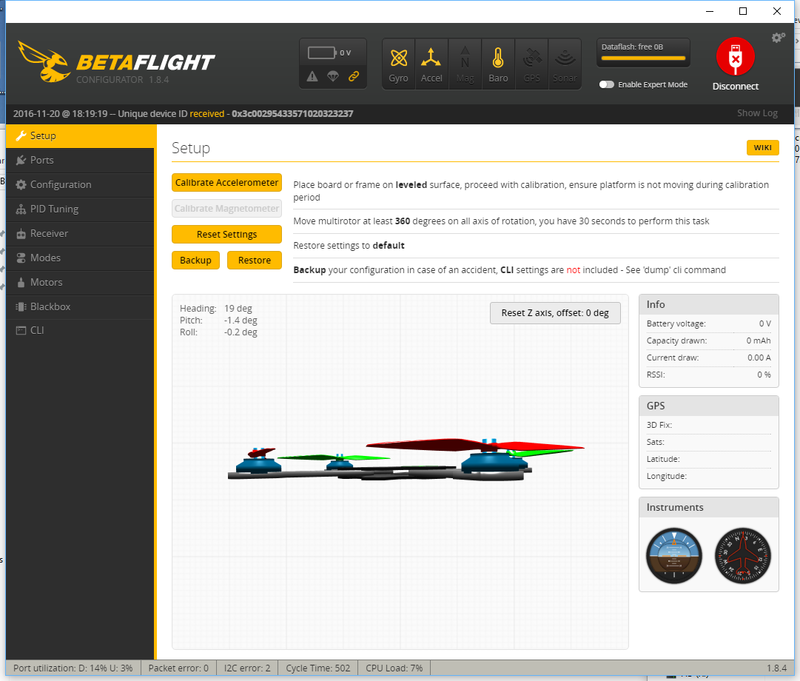 Now it is time to install the propellers and do a first flight test. Note the propellers are not all the same: pay attention to their shape before you mount them. Consider the motors turning directions and select the propeller that works for the related directions. A big Thank You goes to all the contributors of tools and software described in this post. I also want to acknowledge the blog posts from Nathan Vertile and the countless YouTube videos I used as guides for this post. In part 1 of this series I demonstrated how ffmpeg can be used to dump live video streams from IP cameras to a hard drive. 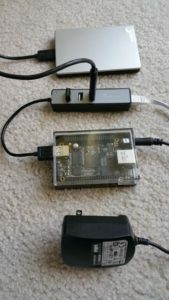 In this post I will show how a Beaglebone Black board can be used to build a cheap and energy efficient video recorder. Given that the recorder is not re-coding any of the camera streams the CPU requirements are quite moderate. The processor only collects the streaming data and copies them to a hard drive. Hence using a Mac or PC as a host platform is quite an over-kill. Also from an energy and cost point of view a smaller size computer is a much better fit. Embedded systems like the Rasberry Pi or Beaglebon Black should be perfectly capable of handling this task at a fraction of the cost. So in the next few section I am going to walk you through the process of setting up such a IP-DVR system. The Beaglebone Black (BBB) comes with a single USB 2.0 host and Ethernet port. For our setup we need at least 2 x Ethernet ports. One to connect the camera (LAN Port) and one for the connection to the internet (WAN port). The easiest way to add the second Ethernet port is the buy a USB-RJ45 Ethernet adapter. However this would occupy the USB 2.0 port so we also need a USB hub to add an additional port for the hard drive. Fortunately there are combined 3-Port USB 2.0 Hub with RJ45 Port offered at your local computer store or on-line. They give you flexibility as you will have spare USB ports to add WIFI or other USB devices in the future. The following description assumes the latest BBB Debian Linux installation. If you are still using Angstrom please install the Debian Linux. No worries, it is very easy to do and there are many description out there that walk you through the steps. I just give an outline here assuming you use a Windows machine to write the Micro SD card. Pull the lates image from the official site: http://beagleboard.org/latest-images. Then unpack the image with 7-Zip. You can now write the img-file with a utility like Win32DiskImager or WinFlashTool to your microSD card. Once the memory card is written you insert it into the BBB. Connect a USB hub with a keyboard and mouse and hook a Monitor to it. You are now ready to power the BBB up. After a while the Linux environment should be visible on the screen. If you use a SD card that offers more than 4GB of space like me you also want to increase the BBB Image Disk Space. First make sure you boot from the mircoSD card, then adjust the Linux partition with fdisk. The device should now fetch an IP address and once successful you are connected to the Internet. The next driver we are going to install is for the USB TP-LINK TL-WN725N Wifi Dongle. Important to know: there are TWO versions of the “TL-WN725N”, one needs the RTL8188CUS driver, the other needs this RTL8188EU. See wikidevi.com/wiki/TP-LINK_TL-WN725N_v1 and wikidevi.com/wiki/TP-LINK_TL-WN725N_v2 for differences. Bus 001 Device 003: ID 0b95:772b ASIX Electronics Corp. Bus 001 Device 006: ID 0bda:8179 Realtek Semiconductor Corp.
You can take down eth1 (ifdown eth1) before bring up (ifup) wlan2. I was looking for a tool similar to OpenWRT’s LUCI that allows me to administrate the BBB Debian Linux from a web browser. I settled on Webmin. Please leave a comment if you have a better recommendation. Webmin allows you to manage all to most common Linux services like retworks, firewalls, routing, sql, HTTP……. from simple web forms. You can now point your browser to https://myhost:10000 and if everything is properly installed log into your system. If everything went well your firewall is now configured. It is now time to install ffmpeg tool. If you want the latest version follow the next few steps to compile from source code. Now that all the tools are in place you can just follow the instruction of part 1 to capture and dump the video to the hard drive. In this blog we learned to build a simple BBB based IP video recorder. With Debian Linux as the baseline I demonstrated how to install all the additional hardware drivers, tools and software such that the resulting server is able to record IP based video streams to a hard drive for a cost of less than $100 dollars. To all the web sites, blog and forum posts I missed to record so that I could credit them here. To debian.org, elinux.org, webmin.com, ffmpeg.org, firehol.org and all the other contributing opensource communities that jointly created all the software used in this post. Galileo is different, is it? The controller is packed into a Flip-Chip Ball Grid Array (FCBGA) package with 393 solder balls that come with a 0.593 mm ball pitch. The package dimensions are 15mm x 15mm. With this kind of a package hand soldering is out of the picture. 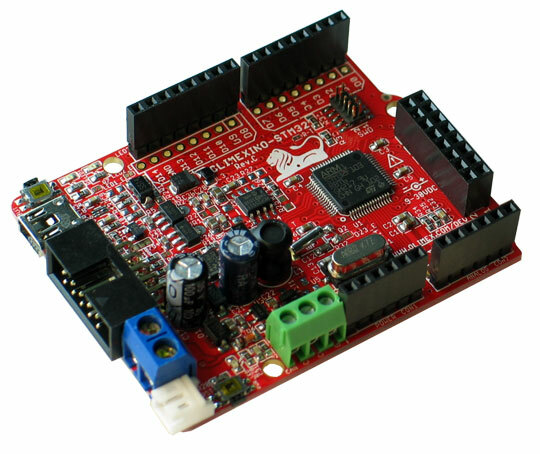 Noteworthy is the implementation of the Arduino shield interface. The interface is pretty much designed with external components. For the GPIO/PWM digital shield pins a Cypress CY8C9540A 40-Bit I/O Expander with EEPROM is used. The analog shield pins use an Analog Device AD7298 8-Channel, 1 MSPS, 12-Bit SAR Analog to Digital Converter (ADC) with Temperature Sensor . 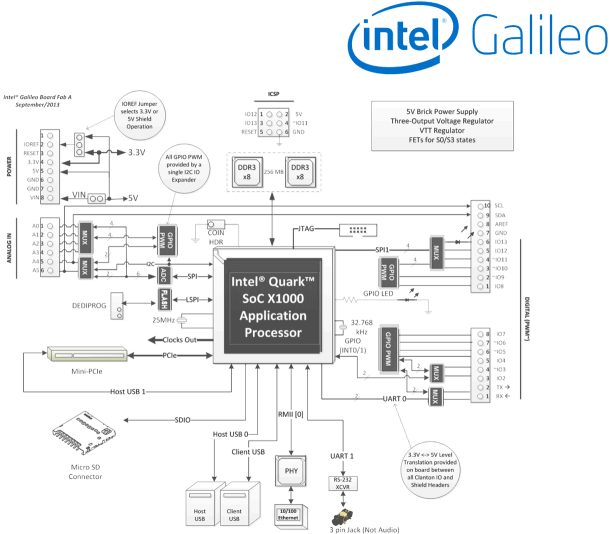 The Quark controller uses I2C serial interface to control the PGIO/PWM CY8C9540A device and the SPI for the ADC AD7298. Today I received my Intel Galileo board that I ordered sometimes in October from Mouser. The shipment date was initially mid November but got pushed back a few times. Anyway, I was planning to toy around with it over the holidays and was thrilled when it shipped December 24th. Galileo must have called Santa and put in a good word. The board comes in a nice box together with a power supply. I wish it had stand-offs to provide some support when sitting on a table. This would prevent the board from resting on the mini-PCI card slot tips mounted on the back-side of the board. Those tips look like they could easily break off. Anyway I will try to document the journey to get the board up and running. For the documentation and software just head over to www.intel.com/support/go/galileo and download the related build for your OS. Intel supports 32/64 bit Linux, Windows and MacOS-X. The release as of this writing is 1.5.3 and gets delivered as a Zip-archive. Downloading the Windows version and unzipping it with the stock Windows un-zipper produced an error because of too long file names in git related files. Using 7-Zip however completed without a hick-up (see also the Galileo Getting Started Guide) . The next step is to plug in the power supply and connect the Client-USB port with a micro USB cable to your computer. Once the Galileo USB port is detected by your computer (it shows up under “Gadget 2.4”) you must install the related serial drive. It can be found in the IDE installation directory under ./hardware/arduino/x86/tools/linux-cdc-acm.inf . Now it is time to start the arduino IDE and perform a firmware update. You can find the menu entry under Help->Firmware Update. I have played around with the Arduino and had fun with it. However I am accustomed to more powerful micro-controllers than the AVR CPU. So it was only a matter of time until I started to look for an ARM based board that offered Arduino shields. One board that caught my attention was the Olimexino-STM32 board. The board is a derivative of the Maple board from LeafLabs and also supports their Arduino like IDE. 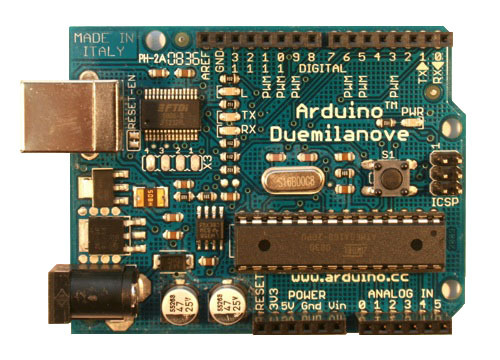 A few years back at Maker Fair in San Mateo, California I came across an Arduino Duemilanove board. I have been playing and earning a living with micro controllers for more than two decades. So naturally I was curious to learn more about what was at the heart of the Arduino movement. What better way than just try it out. What interested me was the ability to combine the Arduino board with shields. Therefore I also picked up a few shields, among them a LoL Shield. Installing the Arduino IDE was easy and with all the source code available on the internet I was quickly up and running, playing around with LEDs, servos and sensors. This ease of use was probably the main reason why Arduino quickly became popular in DYI circles.